In 1875, the emergence of American Catholicism on the universal stage was heralded by Pope Pius IX's appointment of Archbishop John McCloskey of New York as the nation's first cardinal. Forty-six US prelates have since joined the college, including six of McCloskey's Big Apple successors. 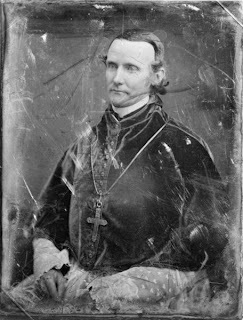 While remaining pastor of St. Joseph's, Father McCloskey served as the first president of St. John's College, which is now Fordham University, a post he held until 1844, when he was appointed Coadjutor to Archbishop John Hughes "with the right of succession." Some expressed surprise that the exuberant, controversial Hughes would have chosen the quiet, self-effacing McCloskey to succeed him. Others count Hughes' choice to be among the best he ever made. There are many more achievements of the first American Cardinal that could be listed here. However, in the interest of understanding the kind of person he was, perhaps it is best to recall just two anecdotes about him. The first comes from the pen of the second American Cardinal, James Cardinal Gibbons, who wrote of McCloskey: "A few minutes before he was to ascend the pulpit to deliver the opening address at the Second Plenary Council of Baltimore, a telegram was handed to him announcing the destruction of his Cathedral by fire. His Eminence preached in his usual tranquil and unruffled manner. When I expressed to him the next morning my surprise at his composure, he replied: 'The damage was done, and I could not undo it.'" William Tecumseh Sherman, the Civil War general who led the bloody "March to the Sea," had a son who wanted to study to be a Jesuit. Sherman wrote a letter to McCloskey telling him to dissuade his son from such an unthinkable course of action. The Cardinal met with young Sherman, listened to his story and encouraged him in his vocation. The General contacted the editor of a St. Louis newspaper, condemned the Cardinal in the most offensive terms and accused him of robbing him of a son. The editor telegrammed the Cardinal for a comment. The reply was classic McCloskey: "General Sherman's letter was marked 'personal and confidential.'" And he never mentioned the matter again. While McCloskey and Baltimore's James Gibbons each enjoyed the distinction of being the country's lone prince of the church, the increasing size and clout of the fold on these shores was met with a consistent increase of its representation in the papal senate. Currently, the American cardinals number a record-high 17, all but four of whom are under age 80 and, thus, may vote in a conclave. Only Italy's 22 electors comprise a larger bloc.